9.5 oz - approx. 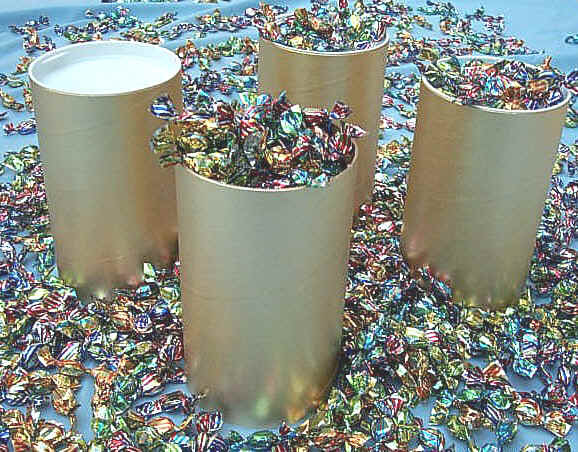 220 pieces - in a Gold Tower (food-quality cardboard tube ). 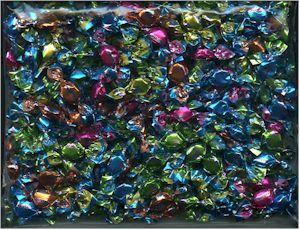 Approximately 10.1 oz - 232 pieces - in a 6.5"dia. x 2" high tin. Puntini Half-pound sealed plastic Bag - approx. 185 pieces. 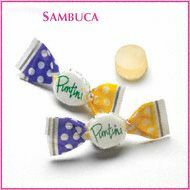 Puntini Sambuca flavored jujubes capture the delicate, aromatic taste of anise, reminiscent of the world-renown cordial after which they are named. Although sometimes confused with licorice, anise has its own complex flavor which is truly delightful. INGREDIENTS: Sugar, Corn Syrup, Modified Food Starch (From corn and potatoes), Gum Arabic, Sorbitol (a trivial amount to retain moisture only and not as a sugar substitute), Citric Acid, Natural and Artificial Flavors. 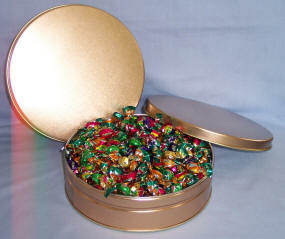 Product Attributes: This candy is free of gluten, fat, sodium, and cholesterol. It contains no artificial FD&C colors or preservatives and is manufactured without genetically modified ingredients.